I have been reading essays by the nineteenth-century writer Vernon Lee. In some of these essays, the reader gets the uncanny sensation that Vernon Lee, despite dying back in 1935, knew all about TV shows and Instagram. 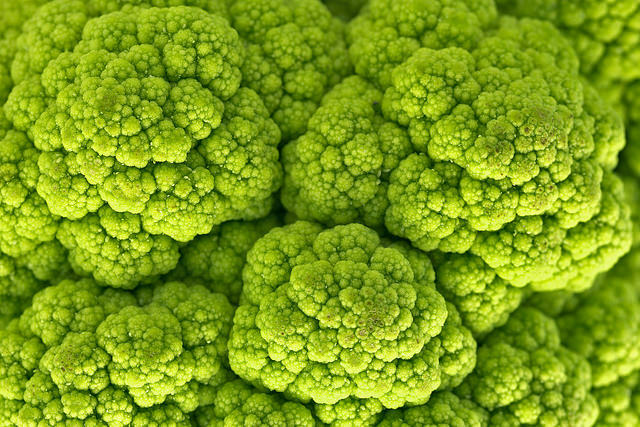 Nicolas Raymond, Green cauliflower, CC-BY-3.0. The fear of boredom […] encumbers the world with rubbish, and exhibitions of pictures, publishers’ announcements, lecture syllabuses, schemes of charitable societies, are pattern books of such litter. The world, for many people […] is like a painter’s garret, where some half-daubed canvas, eleven feet by five, hides […] the Venus in the corner, and blocks the charming tree-tops, gables, and distant meadows through the window. Art, literature, and philanthropy are notoriously expressions no longer of men’s and women’s thoughts and feelings, but of their dread of finding themselves without thoughts to think or feelings to feel. That’s easy: the daubing artists and performers of Lee’s day are the celebrities of today – we want to know what they get up to – and her publishers’ announcements and lecture syllabuses are our click-bait – we like to be distracted, and hate to miss the talk of the day. So-called practical persons know this, and despise such employments [bored art – or bored web browsing] as frivolous […]. But are they not also, to a great extent, frightened of themselves and running away from boredom? See your well-to-do weighty man of forty-five or fifty, merchant, or soldier, or civil servant; the same who thanks God he is no idler. Does he really require more money? Is he more really useful as a colonel than as a major, in a wig or cocked hat than out of it? Is he not shuffling money from one heap into another, making rules and regulations for others to unmake, preparing for future restless idlers the only useful work which restless idleness can do, the carting away of their predecessor’s litter? In short, this work, too, though ‘practical’ and ‘productive’, is undertaken ‘to kill time, at best to safeguard one’s dignity’. So what’s with the rush, the frenzied activity? The quick methods, the rapid worker, the cheap object quickly replaced by a cheaper – these we honour; we want the last new thing, and have no time to get to love our properties, bodily and spiritual. Such persons cultivate themselves, indeed, but as fruit and vegetables for the market, and, with good luck and trouble, possibly primeurs: concentrate every means, chemical manure and sunshine, and quick! each still hard pear or greenish cauliflower into the packing-case, the shavings and sawdust, for export! So long as this be placed on the stall where it courts inspection, what matter how empty and exhausted the soul which has grown it? Vernon Lee’s critique sounds familiar. Stripped of its uplifting elegance, it is printed in our newspapers. It is murmured at birthday parties. And do we not often think it ourselves? Every period in history, it seems, has its critics of mindless production and consumption. Each epoch, complaints about the social rat race are renewed, and the boredom is deplored that masquerades as meaningful activity. By quoting Lee’s essay, however, I do not want to say that we got it really bad this time round. Nor that the issues raised by Lee are of all times and therefore inconsequential, and we should stop sulking. Rather, I want to say that she gives funny and subtle expression to a set of structural issues that almost all of us grapple with in our lives, to do with stress, status and self-worth, with an information overload and with the imperative to work. She also offers us the foundations of a solution. But for that, you will need to find the leisure to read the entire essay ‘About Leisure’. 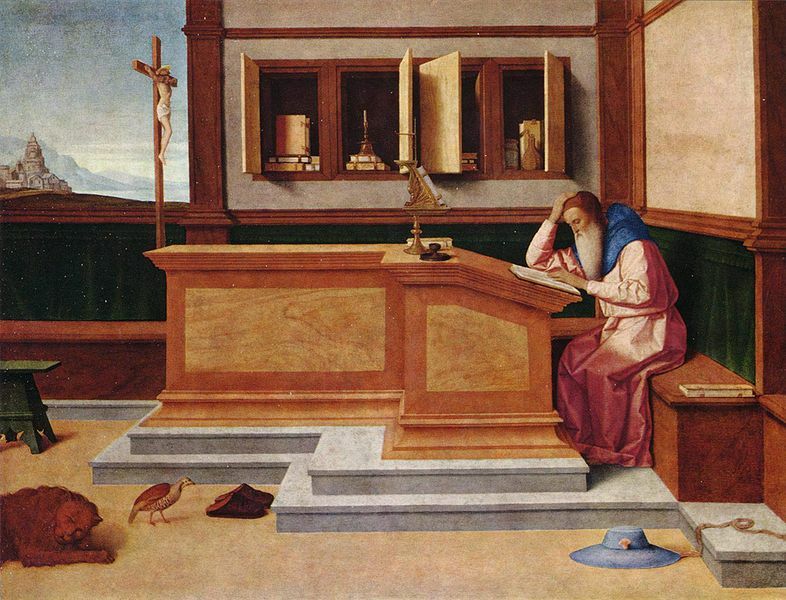 Vincenzo Catena, Saint Hieronymus (early 16th century). Now in the National Gallery, London, no. NG694. Image from Wikimedia Commons. The quotes are from Vernon Lee’s essay ‘About Leisure’, published first in 1897, in Limbo and Other Essays. I’m noticing young people spend less and less time on cleaning their homes. They are too busy or do not enjoy it. I want to put back the fun in cleaning. As far as I’m concerned, a house cannot be too clean. This is from an interview with professional cleaner Liesbeth Verboven. Clearly, she sees the same demise in young people’s cleaning time as I do, only she values it negatively. Now a second question is whether the majority of housewives ever thought of cleaning as ‘fun’. Perhaps they did. Or perhaps they (also) wanted to feel useful. This still leaves us with the question: if nowadays, cleaning is no longer fun; nor needed to fill our time; nor even possible, because we are so busy: why then should we encourage ourselves to do more of it? Sounds like a typical case of finding a problem for a solution. The interview appeared in Eigen huis magazine, May 2016, p. 7. N.B. I don’t want to discourage anyone from reading the book who has to clean anyway, and wants to find out how to do it. Time for the follow-up post to ‘Ironing board will soon be obsolete‘! We were lying by the pool, so my friend’s question was an unexpected one. She herself is a non-ironer, and she seemed to be gauging whether this makes her a bad person. Luckily, I could set her at ease: I do not iron my laundry either. Well yes, the works: from cardigans to underpants. 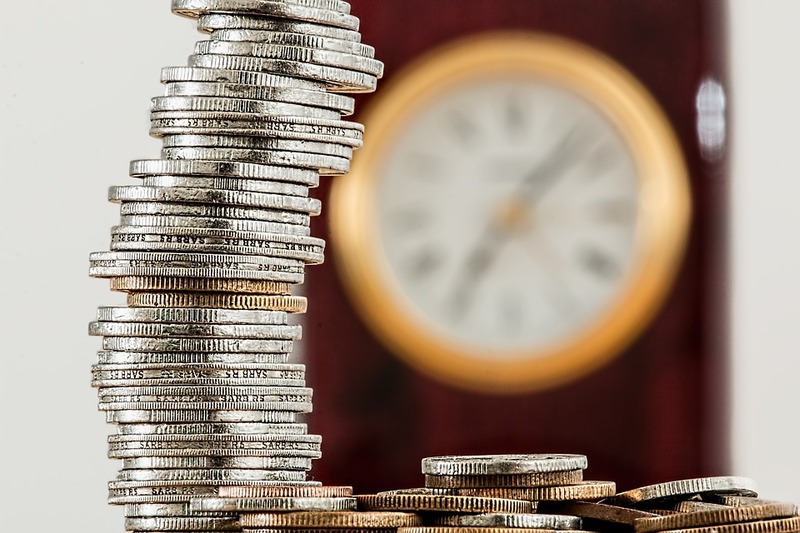 While the recently released UN report ‘Progress of the World’s Women’ draws attention to the burden of unpaid care and domestic work that falls on women globally, it also allows us to ponder how the more affluent parts of the world deal with these tasks. Clearly, women in wealthy countries are no stranger to the difficulty of juggling different duties within the limited hours of the day. However, I found that the question my friend asked me by the poolside signals a remarkable change that we see with today’s young people. This generation of emancipating women are using their time in a new manner. In the second half of the nineteenth century and the early years of the twentieth, housewives set towering standards when it came to the proper maintenance of furniture, floors, windows, linen and clothes. turned over daily. Feather-beds must be turned over and shaken in all directions. and drawing your hand along the lower edge of the pillows, so that their form may be seen, the bed is made. Before making a bed, wash your hands, and take care that your apron is not dirty. Although these efforts may have yielded some health benefits, they were primarily aimed at enhancing a family’s respectability. Next to this, they may have helped mothers who were caring for only a small number of children, but who had nevertheless been excluded from the work force (it was a matter of pride for couples when the wife did not ‘have to’ work), to give purpose to their life: to feel needed. In the 1970s and 80s, second-wave feminists were already different wives from their mothers. No longer did they just take care of home and family: they turned to paid work in massive numbers. Still, they had been raised with their mothers’ domestic ideals: a perfectly neat interior, especially when receiving guests, the children always scrubbed and combed… Beside their paid jobs, wives and mothers continued to spend twice as many hours on home and care as their husbands, both in the UK and in many other countries (see the Multinational Time Use Study database). This ‘second shift’ of work is what led to the feelings of stress and inadequacy many women know so well. In other words, the baby boomers were stuck with a historically high bench-mark in all matters domestic. In spite of a substantial growth in paid labour participation, which now absorbed much of women’s time, the baby boomers have never really rid themselves of this standard. This is a thing which we do see happening with their children. Many of the young women who are starting a household today, and their partners, too, are taking on a new mentality. Of course, women’s time scarcity can also be alleviated by men’s greater involvement in the home, and by hiring professional help. Partly, this is also what is happening. However, the other obvious option young people see, is to simply lower their expectations. A photo taken by the USA Department of Agriculture, Extension Service, around the 1940s: ‘Washington, D.C. Dusting mits with which dusting can be done with both hands develops speed and efficiency. Dusting mit or dust cloth in the pocket, dusting as you clean, eliminates travel time.’ (Currently in the National Archives and Records Administration, College Park. Photo provided on Wikimedia Commons.) 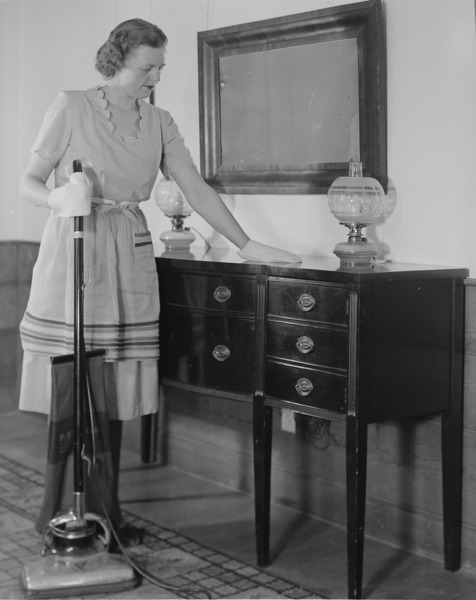 Did the federal government occupy itself with the efficient cleanliness of American homes? I’m no expert on this, but it would seem so. Yes, guests like to sleep on clean sheets, but that does not mean the entire house must shine. Kids don’t like to worry about their clothes in the first place. 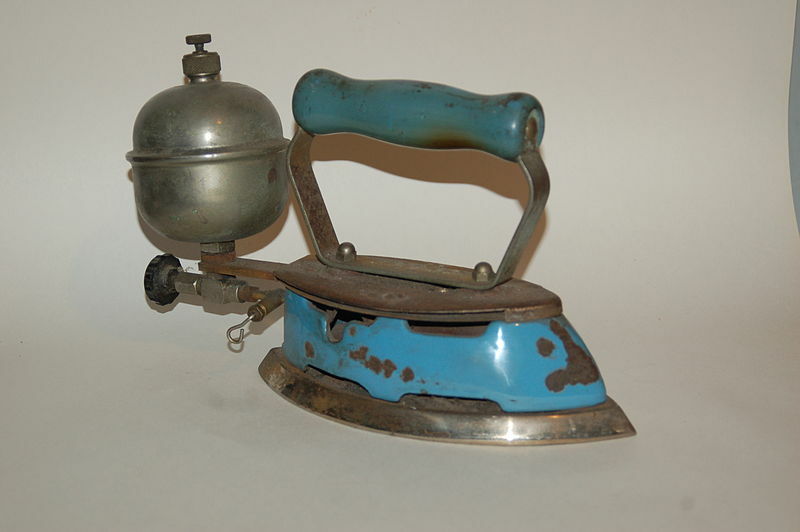 And who knows what will happen to the pressing iron? It might do nicely enough as home decoration next to the washboard and the spinning wheel. If these first indications persist – if women are grasping this opportunity to turn their back on perfectionism, and men are growing just as modest in their expectations – then, perhaps, we can look forward to a little less pressure in our stressful lives. Which is why the best place imaginable to start a discussion about housekeeping, was indeed the poolside. This column has also been published in the University of Sheffield’s History Matters and, in a different version and focusing on the Dutch instead of the British situation, in NRC Handelsblad on the occasion of International Women’s Day 2015.